How Many Sessions Do You Run In A Day? I will happily run up to a maximum of three sessions in any school day. These sessions can be flexible in their duration to fit with your timetable, but should be a maximum of one hour each. What Do The Sessions Consist Of? I offer two types of sessions, Author Talks and Creative Writing Workshops. 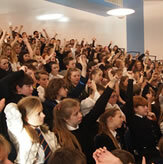 If possible, I prefer to deliver two talks and one workshop in any school visit. What IT requirements do you have? I use a powerpoint presentation for all of my sessions, so require the use of laptop, projector and screen. I don’t require sound for the presentations, or access to the internet. If I’m speaking to a group of over 100 students, a microphone is often handy (lapel if you have one) and a ‘clicker’ to move through the powerpoint makes for a much smoother session. Do you like your books to be on sale during a visit? The obvious answer is yes, but not for purely mercenary reasons! My job when I visit your school is to enthuse your students and inspire them to read. If I do my job well, then there’s no greater thing for your student than to be able to take a signed book away with them at the end of the day. More often than not I travel on public transport, so if you’re able to order books in from a local bookshop, I’d be so grateful. Do you have posters you can send to publicise your visit? I do, and I’m very happy to send some in advance. All I ask is that you help me out by covering the cost of the poster tube and postage. Anything but sprouts. And a stream of tea always helps. For the past four years I’ve travelled all over the UK, and have also facilitated school events in France and Brazil. Obviously if visiting your school means an overnight stay, then I need to charge for accommodation as well as travel. Sorry! I offer both half day and full day rates. Half days consist of up to 2 (x1 hour) sessions, but I can only offer half days if your school is within an hour of my home. For further details of rates, please contact me. I hope this all makes sense. Please sing out if you need any further information. “A recent visit from Phil, with his mix of gentle humour and hard hitting stories, inspired the children in ways a display of paperbacks could never do.